Summary: lifting the ban has gone smoothly, numbers small so far. Why was there a ban and why was it lifted so clumsily? Consequences including prospects for further reform. As announced in September 2017, the ban on women driving in Saudi Arabia was lifted yesterday 24 June. So far the change has come smoothly, with photographs published of happy women driving from the small hours of yesterday morning. So far the numbers are limited, because of the bureaucratic processes of issuing licences etc. More than 120,000 have applied for licences and by 2020 there may be 3 million women drivers. It remains something of a mystery why the ban ever existed in the first place. It exists nowhere else. Women have always walked or ridden in the desert, for example looking after flocks, and that has continued in some places with women driving farm vehicles although the traditional way of life has largely disappeared. There is no convincing Islamic basis for the ban, although senior religious figures have argued that it was necessary and are in difficulty now having to backtrack. The religious establishment are now firmly backing the removal of the ban. Like some other aspects of life in Saudi Arabia it seems to be a case of conservativism for its own sake, in the words of the song once popular in the British Army “We’re here because we’re here because we’re here because we’re here.” It is part of a wider set of restrictions on the freedom of women, but in so far as the purpose of those restrictions is to prevent contact between the sexes it was always counter-productive, forcing women to have male drivers. Such criticism of the change as we have seen seems to reflect little more than the male chauvinism which driving brings out even in the most egalitarian; how many of us would claim that we have never muttered “women drivers” as some other vehicle on our road seems to be driven less than perfectly. A great deal of practical preparation has been taking place, for example driving lessons for women, police training, a motor show for women. The impact of lifting the ban will come slowly. 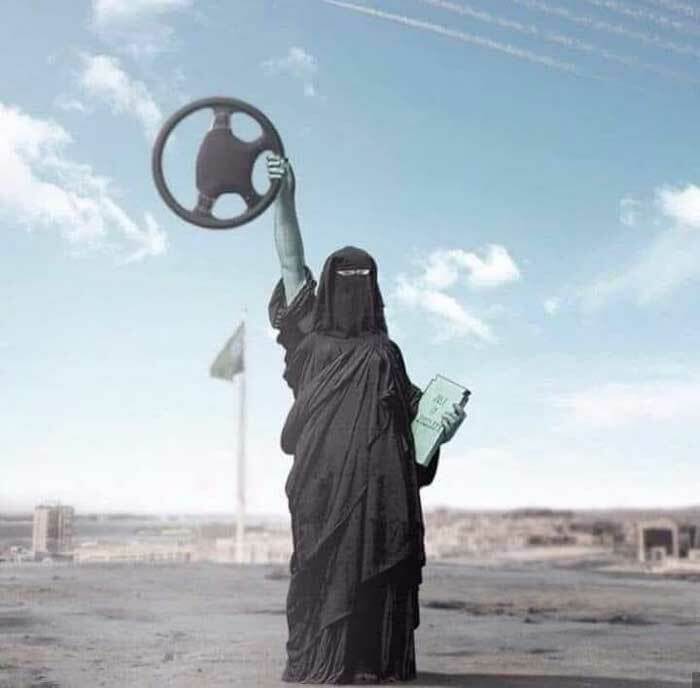 Obviously women – both Saudis and foreigners – will have greater freedom to use cars for all sorts of purposes, less obviously a lot of professional drivers will be out of a job (although many families will retain them), and a lot of husbands and brothers will have time on their hands, no longer conscripted to transport their wives and sisters. The consequences cannot be fully foreseen – for example a 10% rise in the share price of a leading Saudi insurance company yesterday suggests that many people were not convinced that lifting the ban would happen until it did. The detention of many of the women who have been most prominent in seeking an end to the ban has soured much of the media coverage. According to opposition sources what happened was that Saudi agents posing as activists calling for reform trapped these women into statements and actions which could be presented as anti-state. If that is correct, it still leaves the question why the Saudi authorities so clumsily rained on their own parade. Commentators have suggested that it was to make clear that reform only comes from the top, not from the street, but an element of bungling seems most likely. That leads to the wider question of future reforms. Will this change (together with other recent reforms such as opening cinemas) be enough to satisfy the woman in the street, or perhaps more to the point how long will it satisfy her and what lesson will she draw about future reform? History suggests that a limited reform of this kind tends to increase demand for more – as the Turks say the more the elephant eats, the more it eats. The ban on driving was an important grievance, but it also symbolised wider grievances. Any further pressure for change may concentrate on the guardianship system, under which women require the consent of a male guardian (normally father, husband, brother or even son) for a wide range of actions including travel, marriage, employment and even healthcare. In April last year (our posting of 11 May 2017) a Royal directive said that women were no longer required to obtain consent from their guardians for unless this was required by the provisions of the Islamic Sharia. The Supreme Court reportedly called for a review of procedures in force requiring agencies to list all procedures that required the approval of the woman’s guardian and to provide an explanation of their statutory basis for the service within three months.